Key difference: Silk is a natural protein fibre. It is harvested from cocoons created by certain insect larvae. Silk has a smooth, soft texture that is not slippery. Satin, on the other hand, is not a fiber. It is a fabric weave. Satin entails that the cloth has been weaved in a particular pattern that leave one side of the cloth dull, while the other shiny. The cloth itself can be weaved from any fibers, most commonly silk, nylon, or polyester. Silk is a natural protein fibre. It is harvested from cocoons created by certain insect larvae. The most popular silk comes from the cocoons of the larvae of the mulberry silkworm Bombyx mori. Currently, the world’s biggest produces of silk is China and India. China is thought to be have originally harvested and weaved silk. Silk is often used in the production of satin. It can also be weaved into organza, chiffon, shantung, and velvet. Silk has a smooth, soft texture that is not slippery. Silk is considered to be one of the strongest natural fibers. However, it loses up to 20% of its strength when wet. This is why silk cloth can only be dry-cleaned. Silk is not elastic, and will look stretched if it is elongated. It will also be dulled and weakened if it is exposed to too much sunlight. Silk is also a poor conductor of electricity, hence it will not create static. Hence, silk is known to drape well. Silk is often used for clothing such as shirts, ties, blouses, formal dresses, high fashion clothes, lingerie, pyjamas, robes, dress suits, sun dresses and Eastern folk costumes. It is also commonly used for many furnishing applications such as upholstery, wall coverings, window treatments, rugs, and wall hangings. It is also quite popular as bedding and bed sheets. Satin, on the other hand, is not a fiber. It is a fabric weave. Satin entails that the cloth has been weaved in a particular pattern that leave one side of the cloth dull, while the other shiny. The cloth itself can be weaved from any fibers, most commonly silk, nylon, or polyester. However, many consider that only fabric made from silk, be termed as satin. Satin varies in quality depending upon whether it is made from synthetic fibers such as rayon, polyester or nylon or the higher-quality natural silk fibers. 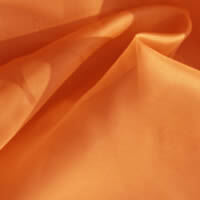 Usually, satin is considered to look very similar to silk, especially if it is silk satin. Satin will always have some sheen. However, many consider polyester satin to be too shiny and slippery. Also, satin, especially the ones made from synthetic fibers, do not breathe as well as natural silk. Satin is commercially popular. It is commonly used in apparel, including baseball jackets, athletic shorts, women's lingerie, nightgowns, blouses and evening gowns, men's boxer shorts, shirts and neckties. It is also used for production of pointe shoes for use in ballet. Due to its appearance, it is also commonly used many furnishing applications such as interior furnishing fabrics, upholstery, and bed sheets. Washing instructions for satin sheets will vary based on its content. Silk sheets, like silk, will require dry cleaning. Other may vary from dry cleaning to hand-washing; some may even be machine washable. As compared to silk, satin is much cheaper. However, again the prices will vary depending on the content of the fabric. 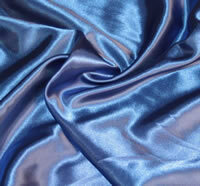 The most expensive satin will be silk satin, while the cheapest will probably be polyester satin.